Out of nowhere, one of my daughters popped this question during breakfast on a morning in mid-April. Memorial Day was over a month away. We were all the way across the country from Vermont, on sabbatical in Berkeley, California. And I hadn’t even finished my first cup of coffee of the day. Such is the place that Middlebury’s Memorial Day parade occupies in the hearts of my children. The 2016 parade will be the fourth that we have marched in: Our family has participated in every Memorial Day parade since 2012, with the exception of 2013, when I was due to give birth to our fourth child at any second and we watched from the sidelines. We always march as part of the group representing Ilsley Public Library’s summer reading program. Our past duties have included wearing pajamas and holding giant dream catchers, dressing as our favorite book characters, and donning superhero outfits. This year we will be outfitted in workout clothes, since the summer reading theme is: “Exercise Your Mind...READ!” As always, we will be distributing erasers and bookmarks to the spectators. It’s hard to explain why the Middlebury Memorial Day parade has become such an important annual tradition for my daughters. The event itself is virtually the same each year, and adheres to the template of all the other Memorial Day parades (and, for that matter, Fourth of July parades) held in towns throughout Vermont. 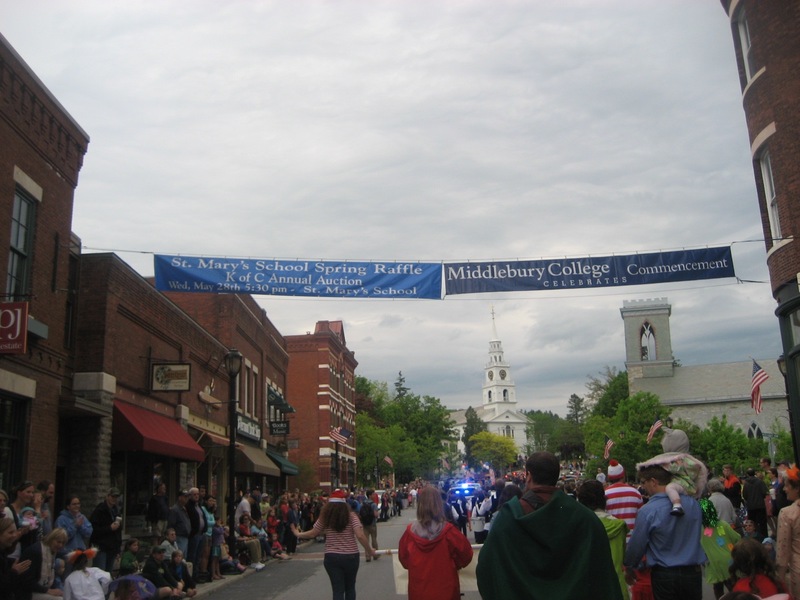 The parade departs from the parking lot of Middlebury College’s Mahaney Center for the Arts and turns down Main Street, ending one mile later at the Soldiers’ Monument on Merchants Row with a ceremony to honor past and current members of the armed forces. There are marching bands, various veterans and local dignitaries walking or riding in convertibles (Bernie Sanders has made appearances), fire engines and ambulances, the Shriners in mini monster trucks, and floats and trucks representing local businesses. There are favors: Depending on the organization, candy is thrown or flyers are passed. One year we scored a couple of tomato plants. But most of these attractions are moot for my daughters. The fact is, if you’re marching in the parade, then you’re missing out on the chance to see much of the parade. You’re also missing out on the biggest parade attraction for the elementary school set: the candy. The Middlebury parade is not even the largest Memorial Day event in the area; that honor belongs to Vergennes, which for years has put on the biggest Memorial Day parade in Vermont. And because so many Middlebury parade participants also march in the Vergennes parade, the Middlebury event begins at 9 AM, which is borderline inhumane on a holiday weekend. Why, then, do my daughters look forward all year to waking up early on a long weekend to walk for a mile passing out bookmarks, without being able to actually watch the parade or reap its sugary benefits? The answer, I suspect, has to do with the interaction between the parade marchers and onlookers. One could say that marching in the Memorial Day parade makes my daughters feel famous, but that’s not quite accurate: Fame involves one-sided adoration, whereas the exchange between marchers and spectators in the Memorial Day parade is one of mutual affection. The parade doesn’t make my daughters feel famous, it makes them feel loved and connected. During the parade, we reaffirm that we are part of a town where we know and are known. Having just spent five months away from our town, I’ve seen that this feeling of connection and belonging is not present everywhere. But you know what are present everywhere? Libraries. My daughters may march for the belongingness they feel during the parade, butI march for the library. One of the very first places we went upon arriving for our West Coast sabbatical? The library. One library card provided our entire family with a steady supply of books and videos, including indispensible materials for homeschooling our children. Our library card entitled us to discounted rates at museums and attractions, which otherwise would have been prohibitively expensive for a family of six. And the library was our “go-to” hangout spot on rainy days. One of the very first places my daughters wanted to go upon our return to Vermont? The library. Both the Ilsley and Sarah Partridge libraries have figured prominently in my daughters’ childhoods, not only as places to go for books and videos, but places where Mona Rogers pops popcorn and teaches them to knit, and where Tricia Allen knows their reading preferences so well that she pulls new releases just for them and even sends new releases from their favorite series across the country while they’re away. Libraries are miraculous for the incredible store of written information they offer, for free, to everyone. But every time I’m in a library, I can’t help but notice all of the other services they provide: a safe place for people who have nowhere else to go, internet access, public restrooms, meeting rooms for community events, daytime activities for young children and afterschool activities for older children, work spaces. The more I see of the world, the more I am convinced that libraries are one of the few remaining institutions that reflect the best of humanity. One could argue that the Memorial Day parade, with its grinning marchers tossing candy to the masses, is a strange or even crass way to honor those who have fought and died in horrific wars. But one could also argue that those who fought and died did so precisely for this reason: So that children and politicians and volunteer firefighters could march safely down Main Street, right past the free public library, and smile and wave to their friends and neighbors.